A Crow Indian legend holds that Old Man Coyote created the earth from a paw full of mud drawn from the bottom of the lake that was the world. He created ducks and deer, cottonwoods and cougars. He created grizzly bears then sent them into their annual winter slumber for insubordination. He created people and gave them fire, and then, later, weapons for war. Old Man Coyote might not have done that if he’d known we’d use those weapons against him one day. No other creature is more celebrated in Native American lore than the coyote. Although legends vary across tribes the coyote is often portrayed as a trickster, pointing out our foibles and weakness with a sense of humor. But the coyote is also reviled by many. Hundreds of thousands of coyotes are killed annually in coyote killing contests, by means of state bounties, by ranchers and hunters, and by the government to appease the interests of livestock growers. While the outcry over wolf hunting in the West rings loud, the coyote gets barely a whisper. These misunderstood canids are a lot like us—resourceful, opportun-istic, adaptable. Pioneers some might call them. Coyotes have colonized nearly every corner of North America and parts of Central America, from the Yukon to Costa Rica, from California to Connecticut. They have even moved into urban areas like Los Angeles, secreting into the city using overflow ducts. They also thrive in Chicago’s parks, ceme-teries, and airport. A few have even been spotted in New York City’s Central Park. Historically, coyotes were limited to the prairies and deserts of central North America. There they hunted voles and mice, rabbits and squirrels, and sometimes deer and antelope fawns. But beginning in the late 1800s, as nascent Americans altered the tapestry of their new landscape, the coyote’s existence became increasingly entangled with ours—for better or worse. Coyotes followed west-bound wagons to California, Oregon, and Washington in the wake of the gold rush era. A few decades later they journeyed north and east to the Great Lakes where they bred with what few wolves remained, giving rise to the coywolf. They then moved into the northeast as we cleared land for agriculture and removed the last of the gray wolf. Coyotes found their way into the south and southeast too. By the mid-1900s, coyotes colonized the coastal plains and slow moving bayous of Louisiana—adapting readily to the muggy swamps. They found their way into the longleaf pine savannahs of Georgia, then north into the farmlands and forests of the Carolinas and Virginia. Eventually, they joined coyotes from the northeast, completing their colonization of America. According to a study on the evolution of coyotes published in the Proceedings of the National Academy of Sciences in 2012, coyotes flourished by exploiting the changes people made to the environment—an opportunism that goes back thousands of years. The authors explain that during the last ice age, coyotes shared the landscape with gray wolves and the larger, more robust dire wolf. But there were other predators too like short-faced bears, saber-toothed cats, American cheetahs, and American lions. These large predators competed with each other for giant sloths, mastodons, woolly mammoths, camels, llamas, and horses. The larger ice-age coyotes probably preyed on the juveniles of these large mammals and scavenged the kills of other predators. But according to the study, towards the end of the Pleistocene many of these large mammals went extinct because of climate change and the arrival of stone-age hunters. But not everyone was so unlucky. The coyote and the gray wolf survived, putting them in direct competition with each other. Coyotes adapted to these changes easily. Over the next 1,000 years they grew smaller and narrowed their range to the deserts and prairies of North America. This opportunism is why coyotes have thrived despite the war waged against them for the last 150 years. The first colonists to encounter coyotes took an immediate disliking to them along with other large predators. They were, and still are, considered vermin by many—a threat to livestock and big game animals that often can be shot on sight. And so began the era of predator eradication that included wolves, mountain lions, bobcats, foxes, grizzly bears, and even eagles and hawks. “Bring them in regardless of how,” was the Division of Biological Survey’s slogan—the governmental agency established in 1896 tasked with predator eradication. The Survey hired hunters who chased coyotes with dogs and shot them with rifles. They used steel leg-hold traps and snares. They fished pups from dens with hooked wires or tossed in cans of cyanide gas followed by a match. They used spring-loaded sodium cyanide canisters smeared with an irresistible lure and tuft of sheep’s wool. Unfortunate coyotes pulling on the wool got a lethal dose of poison, sending them running blind until they collapsed. All of these methods are still practiced today. Public attitudes towards coyotes have changed little over the last 150 years. 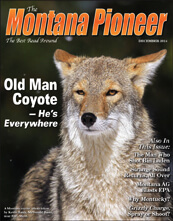 In most states, including Montana, coyotes are hunted without seasons or bag limits. Wildlife Services (the eventual name for the Biological Survey in the Department of Agriculture) removed more than 75,000 coyotes in 2013 alone. But biologists have known for some time that hunting coyotes has counterproductive effects. “In order to have an impact on the coyote population they need to be reduced by 70 percent or more,” Crabtree told the Pioneer. Not just for a year, but all of the time. That kind of hunting pressure is difficult to achieve and maintain explains Crabtree. Coyotes, like wolves, form packs. Packs are usually made up of about six coyotes with a breeding alpha male and female and several non-breeding beta pack members. Crabtree explains that in unexploited populations the alpha pair usually gives birth to five or six pups with two or three surviving to adulthood because of limited food supplies. But, where coyotes are hunted below the 70 percent threshold, pup survival increases. While human hunting of coyotes initially reduces pack size, the reduction in pack size increases the amount of food available to growing pups. So, instead of two or three pups surviving to adulthood, all six may survive, says Crabtree. The surviving pups then become adult members of the pack and by the following year overall coyote numbers are back to normal with little effect from hunting. “With more mouths to feed,” says Crabtree, “coyotes are more likely to take larger prey like sheep.” Once coyotes begin killing livestock they are more apt to continue that behavior, exacerbating conflict with livestock growers. And now it seems the coyote is adapting again. They have followed us into urban areas like Los Angeles, Chicago, and New York City. Coyotes venture into urban environments because of loss of habitat elsewhere and have learned that urban living can be fruitful. Stanley Gehrt, lead researcher for the Cook County Coyote Project in metropolitan Chicago, writes on the project’s website (urbancoyote research.com) that urban coyotes live in greater densities and have greater juvenile survival than their rural counterparts. But those aren’t the only differences. Coyotes are altering their behavior to fit into the urban environment. “Coyotes are normally extremely vocal,” MSU associate professor of philosophy, Sara Waller, told the Pioneer. Waller researches vocal communication in social mammals. Coyotes, like other social hunters, use an array of vocalizations before, during, and after hunts. They bark, yip, howl and whine, and these vocalizations are probably meaningful in some way, says Waller. Waller compared the vocalizations of urban coyotes in Los Angeles to the vocalizations of rural coyotes in southwest Montana. She found that urban coyotes are much less vocal than their rural counterparts. “Coyotes are smart, and if they make noise in urban environments they know that people will pay attention,” explains Waller. To avoid humans urban coyotes travel at night. Bright city lights may mean that coyotes are able to use visual signals rather than vocal signals—a safer alternative in a human-dominated landscape. “We may be able to use this information to reduce conflicts between humans and coyotes,” says Waller. Most urban coyotes subsist on small mammals and vegetation much like they do in rural environments; however conflicts arise when coyotes eat food left out for pets or when humans intentionally feed them. If coyotes begin to associate humans with food they lose their nocturnal instincts and become bolder and potentially problematic. But targeting problem coyotes for removal may be a better approach than wholesale removal, since coyotes quickly fill in gaps in available habitat, as they do in rural environments. The coyote followed our wagons west and our plows east. They thrived under intense hunting pressure and prosper in our cities. Their resilience and adaptability are traits to be admired, yet fear and hatred of coyotes runs deep in our culture. But public attitudes towards coyotes are beginning to change. Increasingly the public supports non-lethal ways to protect livestock and as a result Wildlife Services has invested considerable funds to find non-lethal approaches to deal with problem coyotes. Some ranchers have implemented some of these non-lethal methods such as electric fencing, guard llamas and donkeys, and various scare tactics. In urban environments, problem coyotes can be avoided by securing garbage, keeping pets indoors, and by not feeding them deliberately or by leaving food out. A path to coexistence is possible, but it will take the resourcefulness of both man and the coyote to achieve.